If you have wood or Masonite siding on your home, make sure to check for and caulk gaps on your home's exterior twice yearly. Filling gaps around windows, nail heads and siding with an exterior structural wood caulk will help keep your home in good condition. Caulk is seal or sealant that is used to close up joints where two surfaces or materials meet. On your home's exterior, there are several areas where structural caulk is needed to help protect your home from moisture damage. Gaps between siding boards, the meeting of siding and window casements and changes in siding from one material to another are all areas that require caulk. Wind, rain and snow can get into these gaps, causing damage to the unprotected wood. Caulk is used to seal up these gaps and create a water-tight surface around your home's exterior. Because caulk is a flexible substance meant to move with your home, it can eventually dry up and crack. When this happens, it must be replaced with fresh caulk to continue to protect your home. Twice a year, in the spring and fall, inspect your wood or Masonite home for evidence of cracked or missing caulk. If some is found, it needs to be replaced. There are many different types of caulk available, from those that are used in conjunction with grout in your shower to vinyl caulks and sealants used on a vinyl sided home. Homes that have wood or Masonite siding require a structural wood caulk used for external purposes. Exterior structural wood caulks are meant to bond to painted and unpainted wood surfaces, filling the gaps without shrinking. Wood can absorb water, so it's critical that a caulk be used that will not dry out on contact with the material it's trying to protect. Purchase a caulk for the type of wood or siding you have on your home. 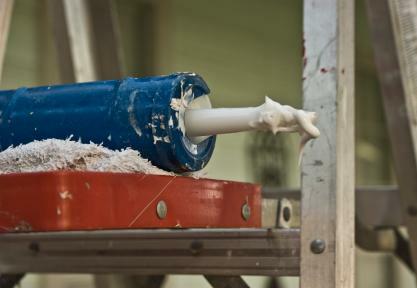 Some caulks work better with painted wood, while others will help protect cedar or Masonite; check the manufacturer's recommendations for the best results. Walk around the perimeter of your home twice yearly and inspect the areas where siding meets window casements, changes material or direction and where the siding may have gaps between boards. Look for gaps, cracked caulk or missing caulk. Cut the cracked or missing caulk free with a utility knife; it should slice out easily. For large gaps, make two cuts, one on either side of the joint and pull the caulk from the center. Use a caulk gun to apply a fresh bead of caulk into the gaps or joints. Wet your finger slightly and use it to smooth the caulk onto the wood or Masonite at either side of the joint. Press firmly as you smooth to create a good bond between the caulk and the wood. Whenever possible, recaulk your home's exterior when the forecast calls for dry weather for the next 24 to 48 hours; the caulk needs time to dry to help seal up the gaps. Good wood caulk should last several years before you'll need to replace it. Even so, make it a habit to check your property regularly; excessive moisture or sun in one area may damage the caulk faster than others. Never assume that all the caulk is in the same condition as the areas that can be seen from the yard. A quick twice yearly scan and a few hours of recaulking when necessary can save you from major structural damage to your home.